WASHINGTON, D.C. — Long before Dr. Ben Carson campaigned for President in 2016, he penned a bestselling memoir — "Gifted Hands: The Ben Carson Story" — which chronicled his journey from an impoverished childhood in Detroit, to global renown as a pediatric neurosurgeon. 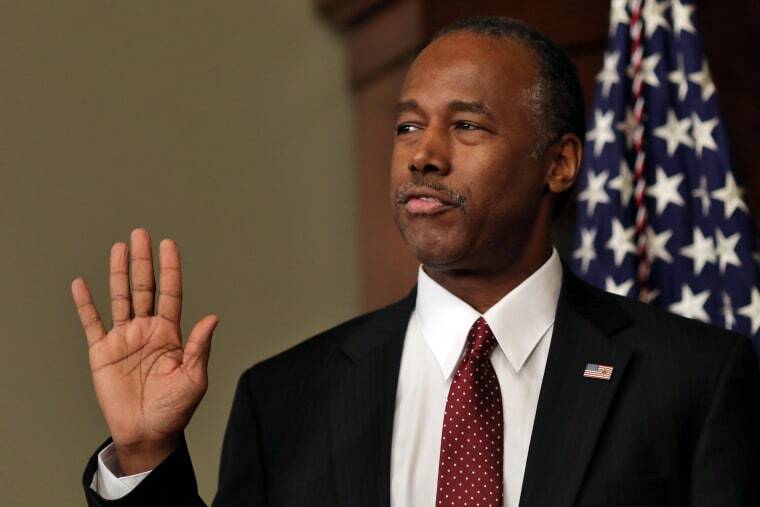 Now the 17th Secretary of the U.S. Department of Housing and Urban Development (HUD), who is the only African American in President Donald Trump’s cabinet, wants to use his "gifted hands" in service to the American people. "Right now, our country is the patient. And it's not a Democrat or a Republican patient. It's a patient, it's an American patient," said Carson, who was confirmed Thursday by the U.S. Senate and sworn in later that day. "And we have a duty to use the gifts that God has given all of us in order to heal that patient." Vice President Mike Pence administered the oath of office to Carson, inside an ornate ceremonial room at the White House complex. Carson’s wife, Candy, and granddaughter, Tesora, held the Bible, while one of his three sons and a daughter-in-law beamed with pride from the audience. Indeed, the mood was celebratory as Carson’s relatives, friends and White House aides like Omarosa Manigault and Kellyanne Conway mingled and chatted. Also on hand: Sen. Ted Cruz, R-Texas and former Texas Governor turned Energy Secretary, Rick Perry — among Carson’s GOP rivals during the presidential primaries. Carson, 65, retired in 2013 after three decades as Director of Pediatric Neurosurgery at the Johns Hopkins Children's Center in Baltimore, a position he assumed at just 33 years old. Since that time, he's received the Presidential Medal of Freedom and numerous honors, written nine books (several with his wife). Together they co-founded the Carson Scholars Fund, which has awarded more than $7 million dollars in youth scholarships, and installed Ben Carson Reading Rooms around the country. Now, the physician turned politico will head a massive federal agency that administers numerous housing programs, including management of approximately 1.2 million housing units nationwide. HUD has some 8,000 employees and its budget was nearly $50 billion dollars in FY 2016. While Carson described himself as "immensely grateful and deeply humbled" to take on the role, his lack of government or housing policy experience has stirred criticisms, particularly among Democrats on Capitol Hill. His Senate confirmation vote was 58-41, skewing mostly along partisan party lines. "As impressive as his medical resume might be, he is not the right choice to lead [HUD], one of our federal government’s most complex agencies," said Sen. Ben Cardin, D-Maryland, who voted against the nomination. "My concern is heightened because HUD has a very tangible impact on people's lives. Dr. Carson would oversee an agency with the broad power to shape cities like Baltimore, where about 27,000 families live in HUD subsidized housing or receive the department’s help to pay their rent," Cardin said. Many have expressed concern that the new Secretary’s conservative political beliefs, coupled with provocative statements about the ineffectiveness of government assistance programs, fly in the face of HUD’s programmatic goals. For instance, Carson has called the Affordable Care Act "the worst thing that has happened to this nation since slavery." On HUD in particular, he’s addressed the "Affirmatively Furthering Fair Housing" rule — which requires communities to address segregation — by saying, "Based on the history of failed socialist experiments in this country, entrusting the government to get it right can prove downright dangerous." Still, Carson walked back some of that rhetoric during his confirmation hearing. He pledged to "aggressively enforce the Fair Housing Act," and referred to the law as "one of the best pieces of legislation which we’ve had." Moreover, supporters describe Carson — a graduate of Yale University (where he met his wife of 41 years) and the University of Michigan Medical School — as brilliant and capable. Several national organizations have expressed a willingness to give him a chance. "We look forward to sitting down with Dr. Carson," said Marc Morial, President/CEO of the National Urban League (NUL), a civil rights organization dedicated to the economic progress of under-served communities. On NUL’s wish list: a comprehensive jobs and infrastructure proposal that specifically includes urban-based, minority-owned small businesses; job training for African Americans, urban and youth workers; and funding for the development of small community facilities. "We think these direct initiatives will economically benefit and stabilize black and brown communities," said Morial, a former mayor of New Orleans. "We are ready to work with the HUD Secretary on advancing our goal of uplifting urban communities." The National Fair Housing Alliance (NFHA), a consortium of about 220 nonprofit fair housing organizations, civil rights agencies, and individuals throughout the U.S., released a statement after Carson was confirmed. The group urged him "to tackle immediately the many critical housing challenges that our country faces." "Many of these are a legacy of the financial and foreclosure crises which disproportionately impacted America’s communities of color," said Executive Vice President, Lisa Rice. These communities have yet to recover." NFHA also estimates that more than 4 million instances of housing discrimination occur annually. "In addition, in recent months we have seen a disturbing uptick in hate activity, including the targeted vandalism of people’s homes because of race, national origin and religious affiliation," Rice said, noting that such acts violate the Fair Housing Act, which HUD enforces. "We look to Secretary Carson to marshal the resources of the department he leads to combat this problem, and to fight all forms of housing discrimination." Carson — a soft spoken man and devout Christian — hails from a background that dovetails with some of the challenges faced in America's cities. Raised by a single mother with a 3rd grade education who worked multiple jobs to support her two sons, Carson and his brother were encouraged to read and study. As a physician, he performed groundbreaking surgeries, including separating conjoined twins, dramatically portrayed in the 2009 television movie, "Gifted Hands" starring Cuba Gooding, Jr. in the lead role. "Working directly with patients and their families for many years taught me that there is a deep relationship between health and housing," said Carson in a statement recently released by HUD. "I learned that it's difficult for a child to realize their dreams if he or she doesn't have a proper place to live, and I've seen firsthand how poor housing conditions can rob a person of their potential." HUD officials indicated Carson's early plans include a listening tour of select communities and agency field offices around the country, beginning in his native Detroit. He is slated to address the agency's employees on Monday. "I am excited to roll up my sleeves and to get to work," he said.